Chef Scott Snyder grew up in California, but draws inspiration from his family’s Israeli roots while cooking. He is the Chef and Owner of French-Arabesque restaurant, Levant in Portland. 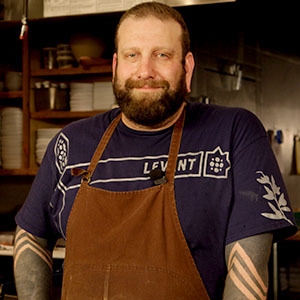 At Levant, Chef Scott applies traditional French culinary techniques to Sephardic-Jewish cuisine. Levant has been called “one of 2013’s most auspicious openings” by Eater Portland. Before opening Levant, Chef Scott honed his culinary skills at popular San Francisco restaurants, Jardiniere and Postiro before moving to Portland and taking a position at Portland landmark, Wildwood in 2008. A simple sauce with complex flavors tops grilled crab for a delicious and impressive dish. This traditional North African paste is spicy, flavorful, and can be used in many different applications. Learn how to break down fresh Dungeness crab, just in time for grilling season. This fresh and fragrant sauce will add a kick of Middle Eastern spice to any dish. Learn how to make a traditional version of Shakshuka, Israel's national breakfast dish.